Brent Smyth was motivated in part to become an Imerman Angels Ambassador through his friendship with a woman, Isabelle, who found great comfort in her Mentor Angel during her fight with an extremely rare type of cancer. Brent, who had been an active volunteer with Imerman Angels in Ottawa, Canada for several years at that point, put Isabelle in touch with the organization after she was diagnosed in 2012. Isabelle’s relationship with her Mentor Angel, Tracy, proved life changing. “Isabelle told me her Mentor Angel was a godsend to her because she could call or email Tracy anytime and regardless of whether they spent that time laughing or crying, she felt centered after talking to her. Isabelle told me on several occasions that when she was through with her fight, she was going to raise funds for Imerman Angels and become a Mentor Angel herself because Tracy meant so much to her. Isabelle was a nurse and used to the clinical aspect of cancer treatment, so she wanted to make the experience better for cancer fighters like herself,” Brent says. Brent was so inspired by Isabelle’s character and strength, he sent her the medal he received for running the 2013 Bank of America Chicago Marathon – which he ran in her honor – because Isabelle’s treatment protocol did not permit her to run. As an avid runner, Isabelle struggled with losing her form of escape. When Brent sent her his medal, he invited her to run with him when she was able. And Isabelle took him up on the invitation, running in a relay race with Brent upon getting the all-clear from her doctor. That race turned out to be Isabelle’s last. She lost her battle with cancer later that year. Brent, who ran his first race as part of Team Imerman Angels in 2011 and has run many since, was introduced to the organization by a high school friend who survived stage IV Hodgkin’s lymphoma and benefitted greatly from his Mentor Angel. “My friend told me his Mentor Angel made all of the difference in the world; it was like night and day. His Mentor Angel was an enormous help with even simple details like advice on the type of mouth wash to use when you develop mouth sores as a side effect of chemotherapy. Just being able to talk to someone who had been there before and knew what lay ahead was incredibly reassuring for my friend,” Brent says. Brent’s high school friend urged him to become involved with Imerman Angels. In addition to participating in races as a member of Team Imerman Angels in order to fund raise, Brent took on several other initiatives to raise awareness. These included posting on social media about Imerman Angels, sharing information about the organization via email and wearing custom made Imerman Angels gear approved by the organization. The efforts yielded results, but when Isabelle passed away, Brent longed to create a legacy for Isabelle by doing more for Imerman Angels. “I connected with Tracy after Isabelle passed and fully realized what a huge impact Tracy had had on her,” he says. When Brent contacted Imerman Angels and told them about his wishes, he learned about the organization’s Ambassador Program. The program was established to generate greater awareness of Imerman Angels and the services it offers via outreach to hospitals, cancer centers and corporations. Ambassadors also represent Imerman Angels as an official liaison at hospitals, meetings and speaking engagements. 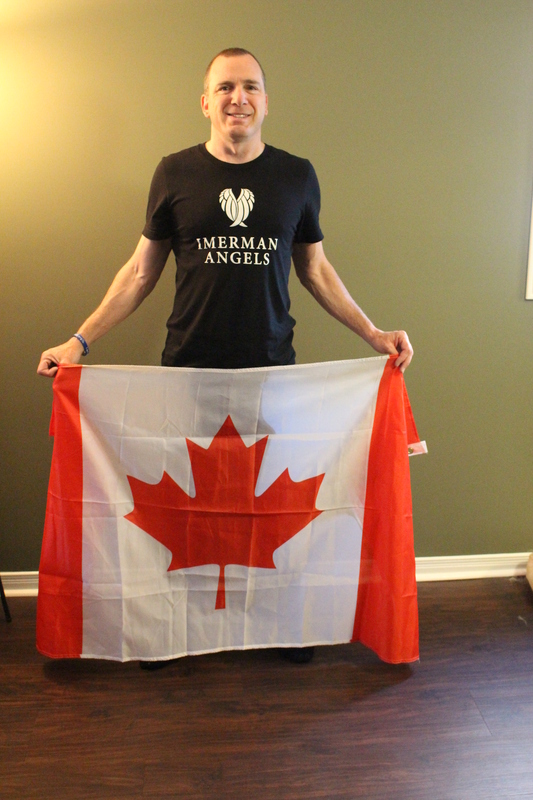 As an Ambassador, Brent has continued posting about Imerman Angels on social media, organized fundraisers, recruited Mentor Angels, secured media exposure and reached out to staff at oncology groups at Ottawa hospitals as well as an alternative complementary treatment center in Ottawa. For the past month, Brent has also been emailing cancer organizations and foundations with focuses on survivorship, social work oncology or peer support to let them know that Imerman Angels offers a service that is complementary to their own services. “I love that Imerman Angels is open to working with other nonprofits. To me, it speaks volumes. Their open attitude reinforces that for Imerman Angels, it truly is about the mission and who is in the best position to help a cancer fighter, survivor or caregiver,” he says. Brent will run the Chicago Marathon as a member of Team Imerman Angels again this year and has additional plans for helping Imerman Angels in the near future. “I have two main goals. The first is to ensure that every organization in Canada involved in oncology is aware of Imerman Angels and knows how to put their patients in touch with the organization. Secondly, I want to see an Ambassador in every major Canadian city, or at least every province, by the end of 2017,” he says. To date, Imerman Angels has 25 Ambassadors in 20 cities and four countries. Ambassadors are engaged, energetic, passionate and devoted volunteers who are dedicated to increasing awareness of our mission and vision on a worldwide scale. These passionate individuals play a vital role in making the world aware of Imerman Angels. Click here to learn how you can join Brent as an Imerman Angels Ambassador and spread awareness about our free one-on-one cancer support.